McJesus is injured from crashing into the Flames net. Oilers get a PPG as a result. The analysts playing it over read his lips. He said ‘it’s broke’ referring to his left leg. Crossing fingers he was mistaken. The x-ray was negative, but McDavid’s going for an MRI on Monday. The number of times Mark Giordano has done that same move when he was beat. Not the best Defensive player in the league. Just let your goalie try and make the save. Just a poor play on his part. It could have went the other way and caused an injury towards his goaltender. It won't be the last either. The Avalanche have a lot of speed and skilled forwards, Just count how many times he'll repeat this same play. I’m hoping it takes him off the list of Norris candidates. Yup Take him off the list. He got beat and did this to himself. I think he has the best plus minus rating that puts his name in the running. 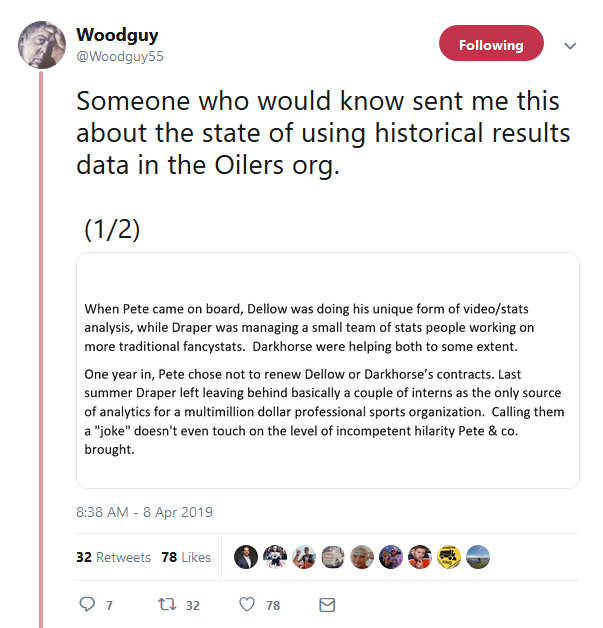 You're telling my Sunday Morning Sweatpants Dad didn't have the mental acumen to understand the importance of using real data in a mathematical model to establish a set of criteria for understanding what the team needed? I am shocked. Darkhorse is a pretty neat Edmonton story. They do analytics work around the world, not just sports. Did accurately predict that the Caps would win the cup. Not that the lames are going past the first round but at least they give their fans something to cheer about in the regular season. Last edited by edTel; 18-04-2019 at 04:38 PM. Now that the Oilers season is over, time to start an off-season thread? Or do that later? isn't that what this thread has been? because i sure hope that missing the playoffs for the 12th time in 13 years isn't going to be considered an on season.